Awarded by the Riksförbundet Stoppa Rasismen (the National Association End Racism). 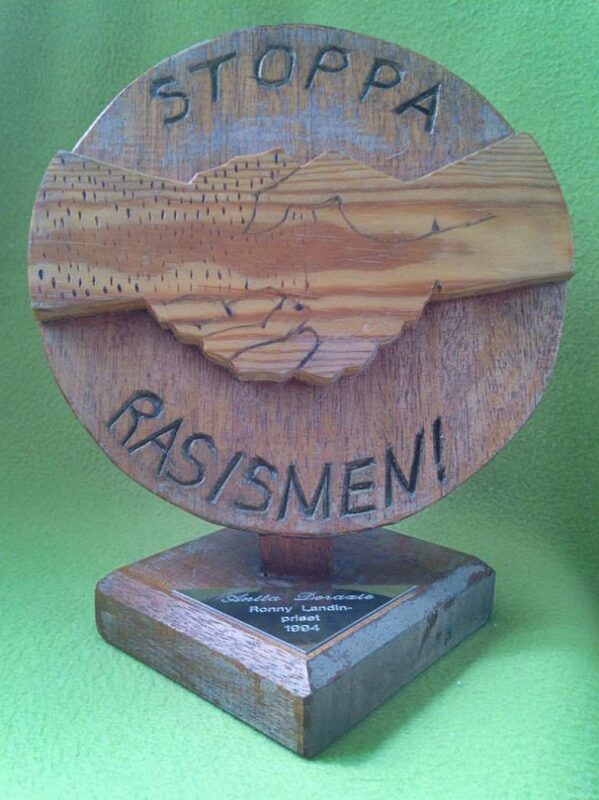 The price was awarded in 1988-1999 to persons who have made contributions in resisting racism and xenophobia. 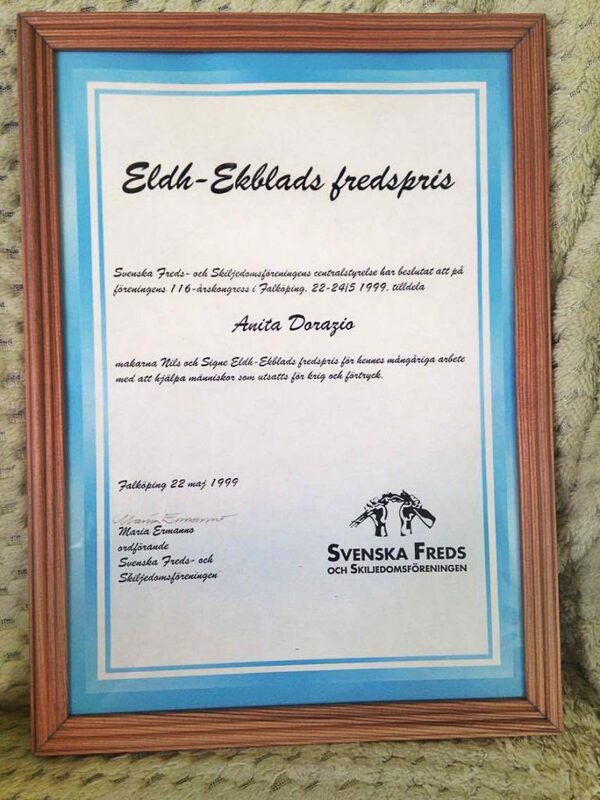 “The Svenska Freds- och Skiljedomsföreningens (The Swedish Peace and Arbitration Society (SPAS)) board has decided at the Society’s 116th-annual congress in Falköping, 22-25 May 1999, to award Anita Dorazio the Nils and Signe Eldh-Ekblad Peace Prize for her longstanding work dedicated to helping people who have been exposed to war and repression.” About The Swedish Peace and Arbitration Society (SPAS) and Eldh-Ekblad’s peace prize. 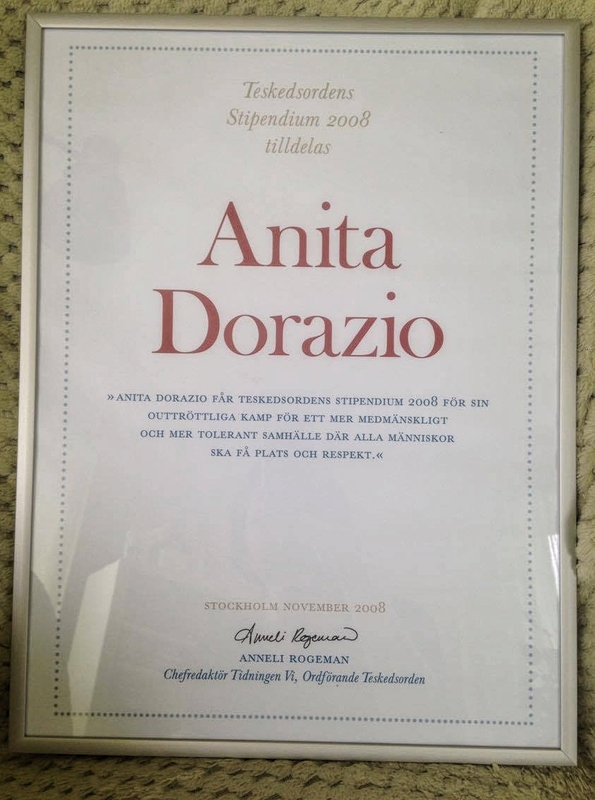 “Anita Dorazio is awarded the The Order of the Teaspoon’s scholarship 2008 for her tireless fight for a more humane and more tolerant society in which all human beings have a place and are respected”. The Anita D’Orazio scholarship 2016. Photo: Losita Garcia. 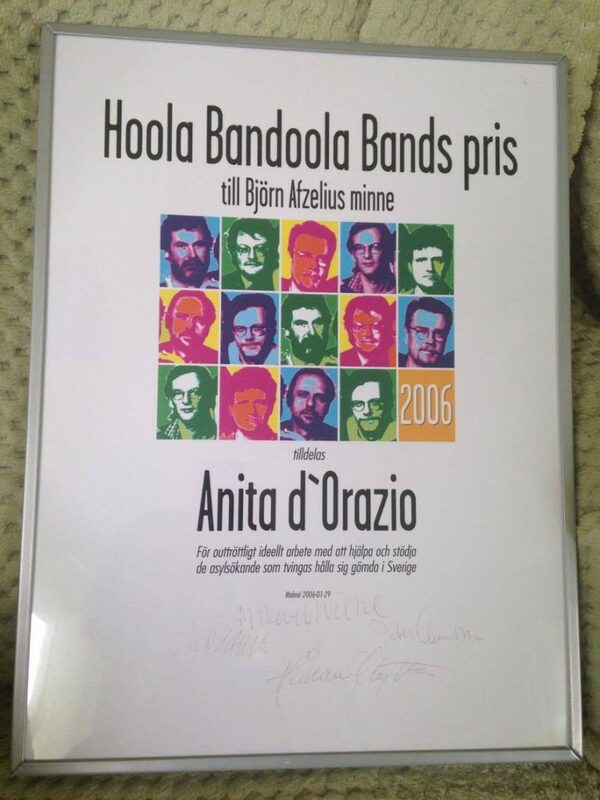 In 2016, the Left Party, ’Vänsterpartiet’ and the Young Left Party, ’Ung Vänster’, instituted an award in the name of and to honour Anita D’Orazio. Ten thousand Swedish Crowns will be awarded annually on the 23 September to individuals or groups who are working for refugees and asylum seekers. 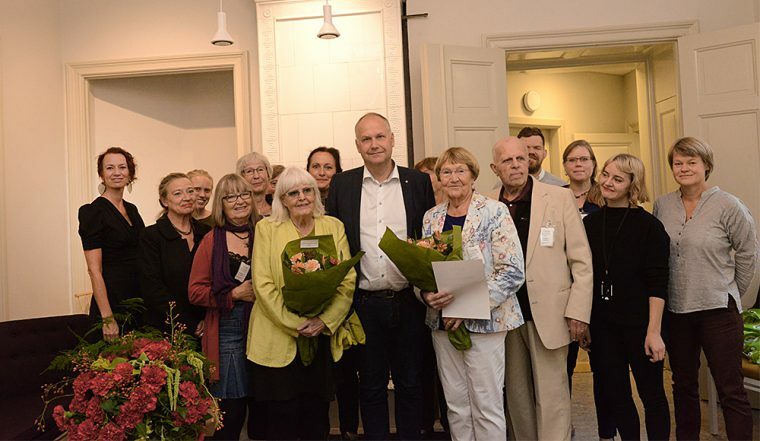 The first award was dedicated to Inger Hassler, who has worked voluntarily for more than 30 years with asylum seekers and refugees in hiding in Flen, Sörmland and across the world. For more information in Swedish see the Left Party’s website: Vänsterpartiets hemsida. 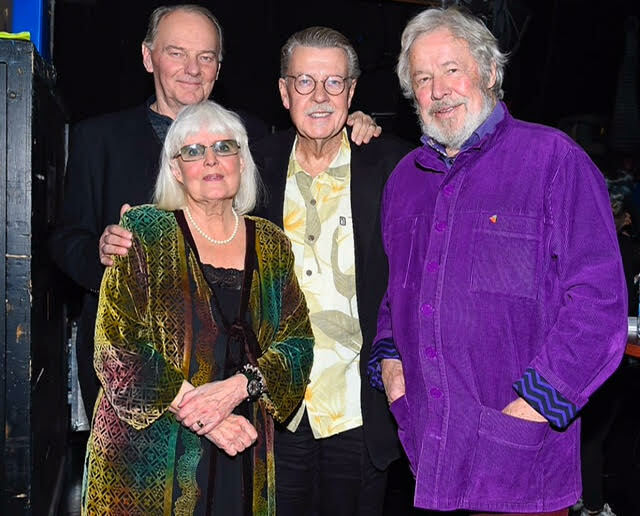 Anita D’Orazio together with actor Björn Granath, singer/musician and composer Mikael Wiehe, and actor Sven Wollter. Photo: Aftonbladet’s photos from the award ceremony Swedish Heroes. The award was covered widely by the media. Aftonbladet wrote about ’Anita’s longstanding struggle for refugees’ rights’ (for article in Swedish: Anitas mångåriga kamp för flyktingars rätt) and also published an article with TV coverage from the Svenska Hjältar Galan (for article with TV coverage in Swedish: artikel med tv-klipp från Svenska Hjältar-galan). 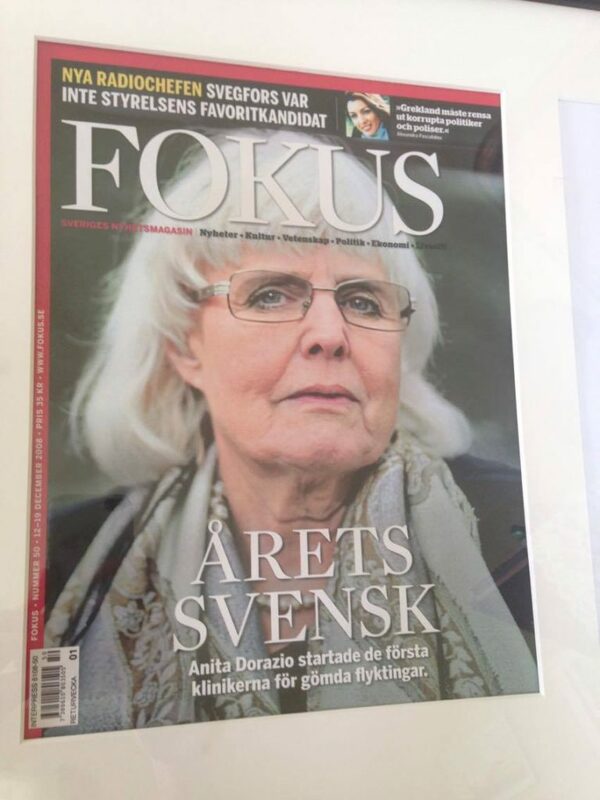 Aftonbladet have also published an article covering the unveiling of Anita’s portrait at the Arlanda Airport’s ’Wall of Fame’ (for article in Swedish: artikel från när Anitas porträtt avtäcktes på Arlanda) at Terminal 5. Swedish Heroes is an award ceremony broadcast by TV4 and co-produced with Aftonbladet. In 2016, the jury consisted of Mark Levengood (chair), Ingvar Carlsson, Silvana Imam, Peter Forsberg, Malena Ernman, Özz Nujen, Magdalena Graaf, Anders Bagge, Mattias Klum, Eva Hamilton and Anja Pärson. Mark Levengood awarded the prize to Anita D’Orazio during the ceremony. 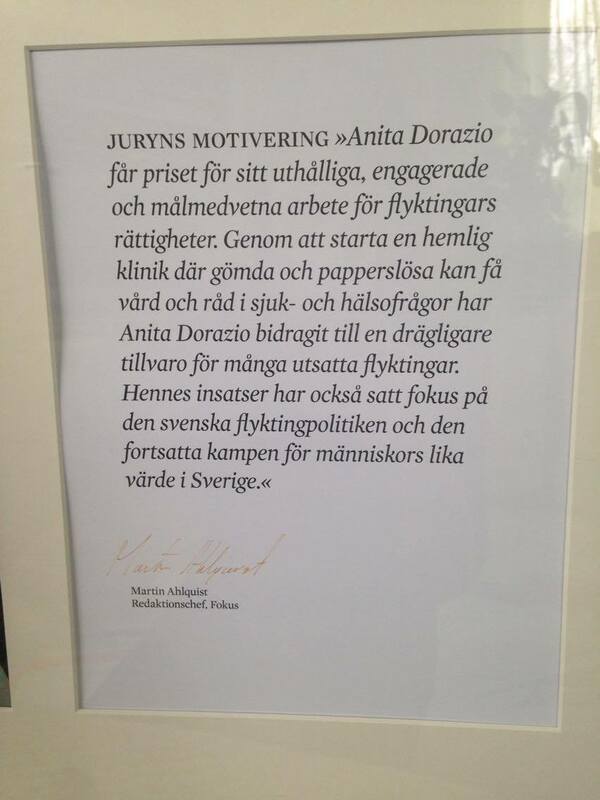 Extract from the nomination: Dear Secretary General, we would like to nominate Ms Anita D’Orazio for the Václav Havel Human Rights Prize 2015. Ms D’Orazio has defended human rights as a human rights activist, advocating for human rights of forced migrants, in particular rejected asylum seekers and undocumented migrants in Sweden, since the 1970’s. 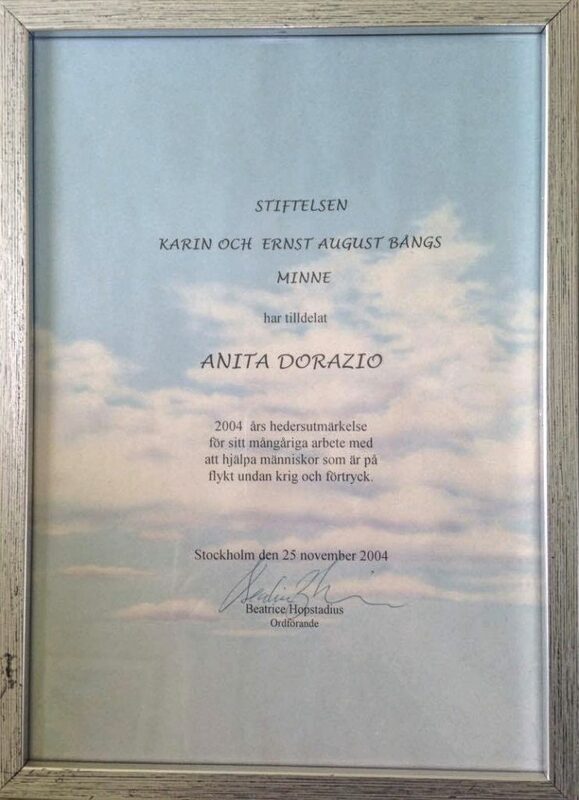 Since the 1980’s, she has founded a number (at least five) of sustainable organisations that work to safeguard the human rights for forced migrants in Sweden. 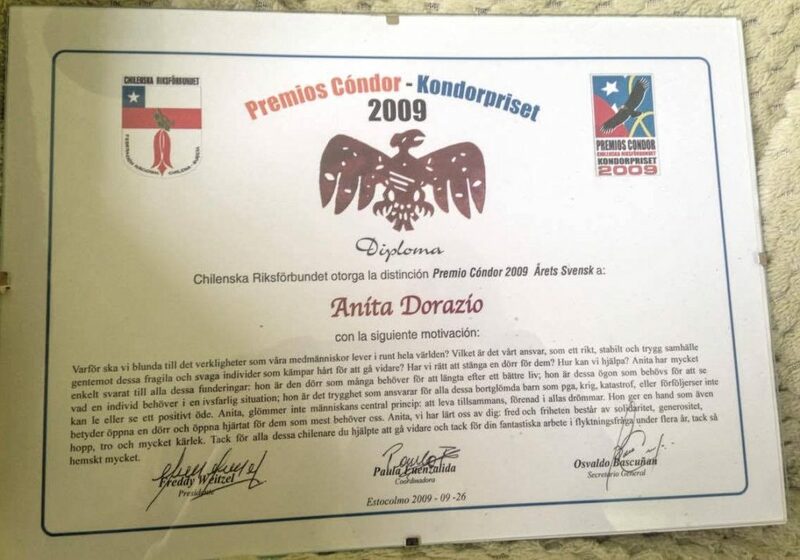 Throughout these decades, Ms D’Orazio has never been paid, but relied on voluntary donations. We are honoured that Ms D’Orazio herself is still actively involved as board member and volunteer in some of these organisations. In establishing these organisations, the focus and the consistent and common denominator has been the protection of vulnerable persons and supporting and securing for them the universal rights such as the right to life, health and health care, the rights of the child, to judicial review and appeal, to a safe haven (including shelter), to rights under the Convention against Torture and to the rights for persons with disabilities as well as protection against trafficking.